Drawing inspiration from the textural stucco arch walls of Spanish architecture, planner and event designer, Tandem Events decided to take their magnificent and silent beauty and turn it into something tangible. 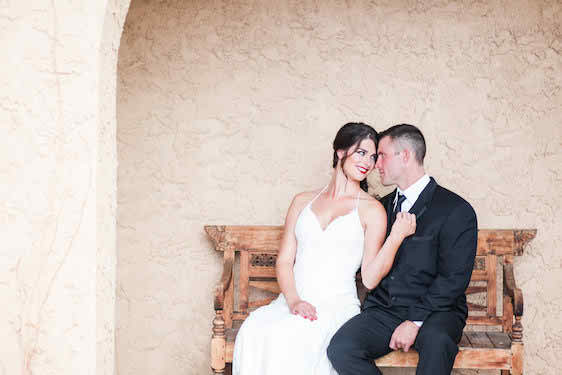 Teaming up with B. Schwartz Photography, and floral designer Ladybird Poppy, and with decor by Yonder Floral + Decor House, this dream team of Colorado wedding pros made the romantic atmosphere of Villa Parker come to life. .... all while softening the look with amber goblets, soft lace, and lush florals. Also totally in love with the Southwestern vibe I'm picking up... ...and these copper mule mugs make such a chic statement, if you ask me! Oh, and can we just talk about how gorgeous this gown is from Emma and Grace Bridal? It's just all so vivid, and vibrant, and bursting with color... Ladybird Poppy truly outdid themselves with this cascading floral runner... ...and can't say enough about this romantic candlelight display... The dark mahogany finish on these chiavari chairs makes a really great contrast... ...and if you know me then you know I'm loving this red lipped bride! Pretty details galore including this custom stationery suite by Ella Vine & Co. And ahhh, I'm just so so in love with this cathedral length veil... Such chic bar cart styling and I love the mule mugs! And can we just talk about the lace detailing on this veil? Lighting and Design by Scott created a warm and stylish ceremony space... ...and I just really adore this creative backdrop idea... And these draped florals? I'm in love! ... the cutouts provide so much interest and the draped florals really make it pop. ...Also who doesn't love the idea of a candlelight lined aisle? Gold played a big role in adding sophistication and elegance... ...and I think it's safe to say that these warm colors stole the show... Really adore this two tier wedding cake designed by Kelley Kakes! Be still my cake-loving heart! And this menu by Ella Vine & Co? I'm in love! This is truly what bouquet dreams are made of, you guys! Seriously? The lace just gives it that extra touch of romance... So beautiful, so enchanting, so out of a fairytale... So absolutely inspiring, if you ask me! With a mix of handpicked gowns by Emma and Grace Bridal, romantic candle light by Candlelight Ambiance, and delicately draped florals — the overall look was strong, beautiful and romantic – just like the stucco walls themselves! Such a gorgeous vision brought to life in the prettiest of ways! I personally adore all of the textural details, the bold pops of color, and this sophisticated Southwest meets Spanish styling by Yonder Floral + Decor House. It's a look that is truly exquisite and it's got me feeling oh-so inspired! Huge hugs and high fives all around to these fabulous Colorado wedding pros! No Comment to " Spanish Meets Southwest Wedding Style "